Teenage soul singer Joss Stone has come fifth in BBC News Online's Sound of 2004 survey to find the best new music artists. Tips from 60 influential music critics and broadcasters were compiled into a list of artists who they think are likely to enjoy success in the next 12 months. We will be revealing one artist from the top five every day this week until Friday, when the winner and full top 10 will be announced. Joss Stone's manager has a trick he likes to play on people who hear her music for the first time. He plays the CD of her big-voiced, often emotional, sometimes troubled vintage-style soul while the singer is waiting in the next room. Just as the listener is visualising an Aretha Franklin-style diva, he calls in Stone, a blonde 16-year-old from Devon, England. This combination of strong, soulful voice with innocent looks and youthful experience has caused some raised eyebrows in her short career. She "is a lot more Britney than Whitney" noted the New York Times. "That is - until she begins to sing." The strength and depth of her voice have meant her age, looks and origins have been unimportant for many soul fans who have already discovered her. The last three months has been a whirlwind of concerts, travelling, promotion in the US and UK for her debut album The Soul Sessions - and hype. "Joss Stone and her Soul Sessions amount to a load of hype you can dare to believe in," wrote a critic in The Observer newspaper. "It's been really good - I've been really, really busy, I've been on a million planes," Stone told BBC News Online. "I've been to different places, met new people, it's been a completely different experience." 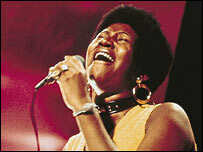 That hype has included press descriptions of her as "the white Aretha Franklin". "I think it's kind of funny," Stone says. "Aretha Franklin? I wish. But it's never going to happen. "It was a real huge compliment and people are being really nice," she adds. The Stone story began when she got Franklin's greatest hits for Christmas aged 10, and went on BBC talent show Star for a Night four years later, singing Donna Summer's On The Radio. Two London producers who saw a later charity show phoned Steve Greenberg, head of the US-based S-Curve Records, to tell him about the greatest British singer they had ever heard. Greenberg says Stone has "not only a great voice but also the ability to put her own original stamp on classic material". "She wasn't just mimicking - she was changing and interpreting the songs, and doing it with passion and feeling," he says. "The level of nuance was just astounding for someone who was then 14 years old." He hooked Stone up with Grammy-winning soul singer and producer Betty Wright, who described the teenager's voice as "a gift from heaven". 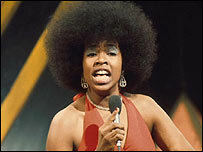 Wright then rounded up her old Miami soul band, some of whom she had not seen for years, to play on The Soul Sessions. The album includes Stone's versions of songs like Aretha Franklin's All The King's Horses and the Isley Brothers' For The Love Of You. She also enlisted jazz-rap band The Roots to back her on a soulful version of The White Stripes' rock song Fell In Love With A Girl - which will be her new single. Her main musical ambition, she says is to play at the Glastonbury music festival - because "it just seems like a fun thing to do and all my friends would be there". She does not have any other specific ambitions, she says - "just sing anywhere and meet new people and be successful I suppose". The Sound of 2004 survey was compiled from the tips of almost 60 impartial music critics and broadcasters, who were asked to give three names of artists who they thought would be successful in 2004. The artists who got the most tips were then ranked in order to compile the Sound of 2004 list.